'Poupee de Madalpour' stands at the apex of the Birman family tree, being the first and only known Birman of pure ancestry to be born in the West, specifically in Nice, France. With the exception only of her imported dam, she was also the only other fully Birman cat of pure ancestry, living in Europe at the time. It was to be from her, that the first and all known progenitors of the Birman breed developed in the West, were ultimately descended. The breed we know today as the 'Sacred Cat of Burma', has been successfully developed, established and re-established, against what today seems like almost insurmountable odds; surviving the critical loss of the only pure male progenitor during importation, the difficulty of finding and selecting viable outcrosses, obtaining recognition for their unique blend of history and phenotypical traits, then miraculously surviving tragic losses both before and during the Second World War. And as if that were not enough, the breed ultimately faced almost entirely the same set of hurdles yet again, during another re-establishment period, post war. Yet, somehow, the Birman has not only survived all these social and historic set-backs, but has eventually emerged as one of the most beloved and respected of modern-day pedigreed breeds; a strikingly beautiful and unique semi-longhair, that can trace its origins back to the mystical underground temple of 'Lao Tsun' in a remote northern corner of Burma, from where it brings into our midst, its exceptional beauty, its sublime grace, and the mystical majesty of those deep sapphire blue eyes, inherited from the Goddess Tsun Kyan-Kse. The birth and ownership of 'Poupee' is inextricably linked to the drama and mystery surrounding the arrival of her dam 'SITA' into Nice, France in 1920. 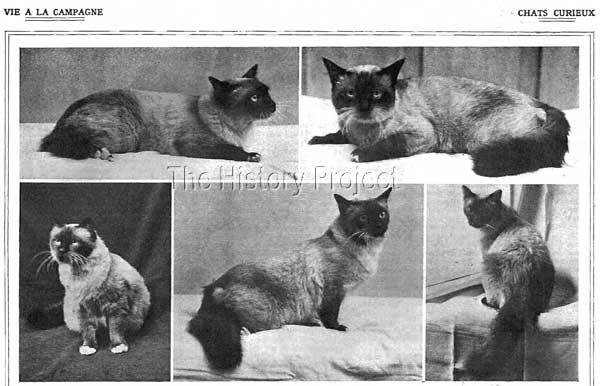 From the various legends and reports surrounding the importation of the first Birmans, the most likely scenario is that one of the servants from the Temple of Lao Tsun was tempted by high reward to steal and deliver a pair of these sacred cats to a contact of the American multi-millionaire Vanderbilt, whose yacht had been cruising in the far east. The two cats were a male, named 'MADALPOUR' and a female name 'SITA'. One can imagine the scene, with these two cats on board the luxury yacht, cruising across the Indian ocean on a heading intended to ultimately deliver them to France. But fate intervened and we are informed that 'Madalpour' met with an accident on board and subsequently died. But amazingly, it was discovered that the female 'SITA' was already in kitten to him, and in due course, she landed safely at the port in Nice. There is considerable confusion over who in fact imported the cats, with initial reports indicating that the cats were intended for a Madame Thadde Hadisch of Vienna, but later investigations drew a blank on this connection, and 'Sita' is reported to have delivered her precious litter in Nice, probably under the care and ownership of Madame Leotardi, with whom she appears to have been duly associated from then on. In that litter, was 'POUPEE', who at the time, was considered to being as close to a perfect specimen as had ever been seen. There are sadly no further reports about her dam 'Sita' or what fate she may have met, or whether in fact she was bred from again. Nor are there any surviving photographs of 'Sita'. 'Poupee' therefore, as the only reported survivor from this one full Birman breeding to be born in the west, becomes the sole full Birman progenitrix of the entire Birman breed, and accordingly, takes her rightful place at the very apex of the Birman family tree. If indeed there were siblings to 'Poupee' from this first and very precious litter, which is not unlikely, and even if they did or didn't have appropriately marked gauntlets, one can imagine how invaluable a male kitten from this breeding would have been. But sadly there are no records to substantiate any other surviving kittens from 'Sita'. From this clarification it would therefore be reasonable to expect that 'Poupee' was probably bred to a Siamese of 'unknown heritage' owned by the Doctor in Nice at the time. We know not whether this cat would have been shorthaired, or whether he could have been a shorthair carrying the gene for longhair, but as Siamese were already well established as a breed in France by that time, it is not unreasonable to expect that the first kittens from 'Poupee' were all short-haired, pointed, some with. and some without the much-desired gloving. 'Poupee' (far right) with her known litter from 1927. GB: "According to Marcel Baudoin-Crevoisier, 'Poupee', the grandmother of all our Birmans, was born in Nice." 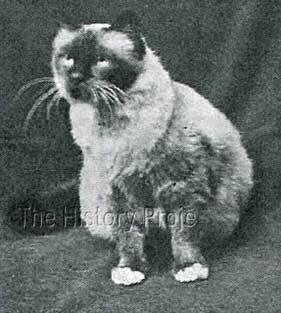 SP: "There at least is a certainty; the Birman cat was bred in the Midi area of France around 1923-1924." GB: "That corresponds perfectly with the thesis written by Phillipe Jumaud, the vet at Saint Raphael. He wrote in March 1925: 'The breeding of the subjects has been particularly difficult.' He confirms this difficulty in his article of October 1926. Mme Leotardi, who has had the opportunity to breed more litters, confirms that one should reckon to breed no more than one good one in ten." SP: "They all admit that the breeding of Birman cats was, from the beginning, shrouded in mystery and a lot of hypothesizing has been done. For example, the breeder of breeders may have used a hybrid, a white-gloved Siamese stud, with a queen with long hair. Or a hybrid 'angora' Siamese stud with a queen with little white gloves. They kept one cat in ten from their outcrosses, the one who had Siamese markings, the longer coat and had little gloves." GB: "Perhaps the very first cross was not planned? I read in the July 1927 issue of Vie a La Campagne a severe warning aimed at cat breeders in general: You must make allowances, with only rare exceptions, for all mismatches which result from accidental liaisons." At this juncture we must consider more carefully, what Simone is suggesting. Her comment that 'Poupee de Madalour' was the 'first valuable result'. Does this mean she is suggesting that 'Poupee de Madalpour was not the original 'Poupee'? Her comment, in the context it is given, is suggestive that the 'Poupee' shown in 1926 is only a descendant of the 'Poupee' born in Nice, in 1920! This is left to readers to speculate on. It is certainly also quite possible that they were one and the same cat. A cat that was born in 1920, is not an old cat by 1926� and if she was the original 'Poupee' she would have had the expected gloves and long coat. There would also have been time in the intervening years, for her to have been bred a number of times and for subsequent progeny to have matured and likewise either bred back to her or to other half-siblings, or other relatives descended from the same cat. Suffice to say, that in the Birman databases, she is recorded as the daughter of the original 'Sita'. 'Manou de Madalpour' is arguably the most well-known of all progeny from 'Poupee'. He made his show debut with her in 1927. Unlike his known siblings, he was long-haired. BIJOU de Madalpour -	Foundation short-hair male. Date of birth unknown. IJADI-TSUN of Madalpour - Foundation short-hair female. Date of birth unknown. LON SAITO of Madalpour -	Foundation short-hair male. Date of birth unknown. MANOU de Madalpour - Foundation long-hair male. Date of birth unknown, circa 1925. SINH de Madalpour -	Foundation short-hair male. Date of birth 1927. LON GOLDEN of Madalpour -	Foundation short-hair male. Date of birth 1927. SITA I of Madalpour -	Foundation short-hair female. Date of birth 1927. NAFAGHI of Madalpour -	Foundation short-hair female. Date of birth 1927. There can be little doubt that 'Poupee' was nothing short of a sensation, when she first appeared at the International Cat Show in Paris in 1926. 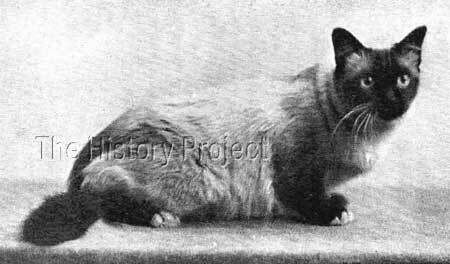 Here was an actual living example of the rarest of breeds, the mysterious 'Sacred Cat of Burma', with its links back to the lost Temple of Lao Tsun! What is miraculous, is that she produced 'Manou de Madalpour' whom, if we are to believe was from a repeat of the original outcross, was long-haired like his mother. He was certainly a lovely cat, as the photo which has survived of him being held by Marcelle Adams confirms. 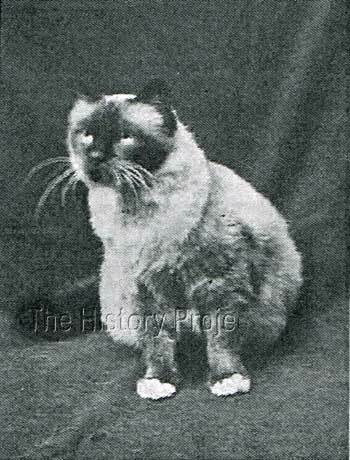 But regardless of who may have been his sire, he was none-the-less a son of 'Poupee' and as such, a direct descendant of the original Birman male, 'Madalpour', who was so tragically lost during the journey from Burma to France. 'Poupee' may have been the beginning of the Birman breed in France, but she was also unwittingly the foundation of what has become the cult of the Sacred Cat of Burma throughout the world. In this respect she has become an icon, a worldly link to an 'other-worldly' past, to the transmigration of the souls of the kittah-lamas and the worship of the sapphire-eyed goddess, Tsun Kyan-Kse. Secrets of the Sacred Cat of Burma, by Alwyn Hill, English Edition 2006.